Sculptor looks quite good but not OP by any means. Acting Troupe looks hard to judge, though quite often worth getting one. Seems like Recruiter is recruiting Villagers for the revolution. Now I have a ton of Villagers and everyone else is dead. This might not be the right game for me. Well. I used some Seers to draw a bunch of Silvers I gained with Sculptor, and then I Mined one into a Gold and Sculpted a Remodel to turn the Gold into a Province with 4 Silvers to spare. It was good enough to edge out a win against Lord Rattington... with first-turn advantage. This is basically the Inception Meme from classic Homage thread. Recruiter seems to be an accelerator in a similar vein as Apprentice. Like Champion, it is difficult to prepare for it with stacking dead drawers. All 8 cards we've seen from the preview are very interesting. This expansion looks very promising. So, Acting Troupe is the 3-word card? I guess written numbers and signs don't count. Overall I love the direction Renaissance is taking. And unlike Feast, Acting Troupe looks actually interesting. Now you can have engines that collapse on their own in the long run. Sculptor looks pretty great. At its worst, it's a nonterminal Explorer, but those Villagers are of course much more flexible, and so is the gaining effect. I like how here again, a simple wording makes for a card with many decisions. And Recruiter will obviously be insane in the early game, but as it - unlike e.g. Baron - trashes the card, that will soon stop. Re-buying Estates doesn't seem worth it to me. Not sure what I think of it other than that you will probably want these earliest you can. Now you can have engines that collapse on their own in the long run. These already exist with the concept of chains (Cultist or Sauna/Avanto). Even extra Labs make them choke. Is Acting Troupe actually playable online at the moment? In all my games I got either Recruiter or Sculptor. EDIT: Ah, finally, in my 15th game or so. Seer+Ferry event was kind of nice. So far, it seems most of the new cards depend on a working engine and +buy to be efficient. Those choke. Having Cultist/Sauna choke on Labs is no different than Markets choking on Militias or any engine choking on green. Acting Troupe gives you decks which run out of fuel even if your deck itself stays the same. So the Sculptor can either sculpt something now, or get paid a silver to sculpt something later. I like these minor thematic touches. The closest thing to Villagers we currently have is Coin of the Realm. Villager tokens are coins. Neat. Diadem basically turns Villagers into Coffers. The tokens are coins for both. Neat. Sculptor + Cemetery is cute. No +Buys yet, but I'm sure they'll be there. Same for non-attack interactions. I hope to see some of those soon because they're my favourite kind of cards. Anyway, the main problem I see with the Villagers (or at least these cards anyway) is that they're inconsistent. In an engine you want a way to get +actions every turn, and these don't really provide that. But they'll be good in the opening I guess, especially Acting Troupe. Anyway, my opinion might change after playing with them. So they are not called "Actors", but then you have Acting Troupe that gets you a bunch of Villagers. "Villagers" sounds so intuitive, it seems like an obvious naming choice in retrospect. Acting Troupe as a replacement for village is tricky because they eventually run out, but then this is a push to try ending the game. Alternatively, you can use several to hoard Villagers in order to try pushing for a mega turn. They also work with Throne Room for 8 Villagers, one of which you can spend right away to continue the turn. Acting Troupe is also nice as a one-of in a deck that has villages already to help with reliability, kind of like Coin of the Realm. Sculptor seems nice for getting early economy while trashing aggressively, and then it can move to gaining nice actions, possibly with previously acquired Villagers. Still, at $5 it is pricy. Recruiter seems very powerful. Use it early to trash Estates and Coppers while getting some Villagers to have it go from a Moat to a Lab if need be. In a deck with +buy or +gain, you can use it as a source of actions for your 2-3 terminals so long as you trash a $5 every other turn. You even get to trash after the draw, though the trashing is mandatory. All in all, I like these cards. I like them, especially Sculptor. I predicted something similar to Recruiter some time ago but then again Salvager for Villagers instead of Coins is kind of a natural idea. 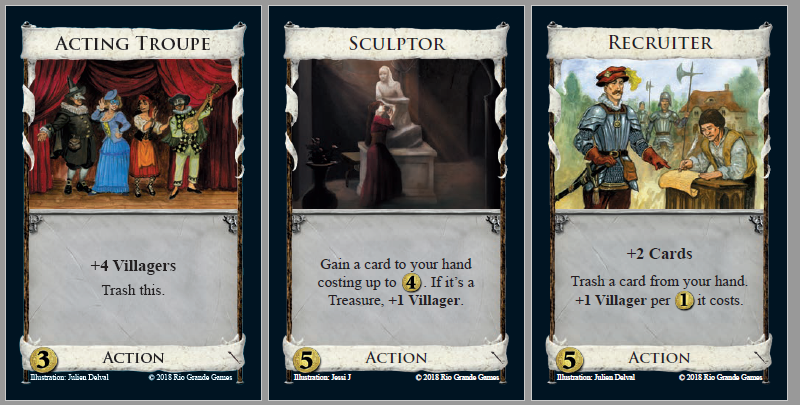 Acting Troupe is also nice as a one-of in a deck that has villages already to help with reliability, kind of like Coin of the Realm. I guess that adding reliability to an engine is the main use of the card. While I don't think that is is impossible to run an engine with just Acting Troupe (with gainers it is certainly feasible) I guess that it will be harder than without an ordinary Village.